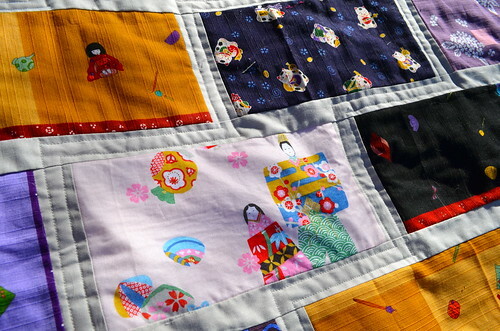 You may remember that my friend, Rebecca, asked me to make her a quilt using the lovely handkerchiefs that she collected when she spent a year teaching in Japan. 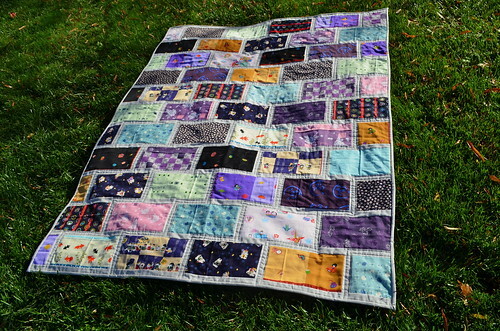 We looked through lots of quilt ideas this summer and she ultimately selected Rachel's Colorbricks pattern. 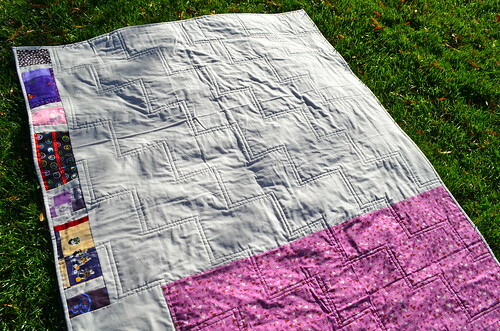 Having already made a Colorbricks quilt (in Nicey Jane here), I was relieved as I knew I probably wouldn't mess up any of her irreplaceable fabrics trying something new or complicated! I finished the binding last night and had to do a quick photo shoot. It is way too bright outside for pictures, but I'm not complaining at all! I sashed it with Kona Ash, which is funny because that is what I used the first time around as well, but the soft gray looked so nice against her fabrics. 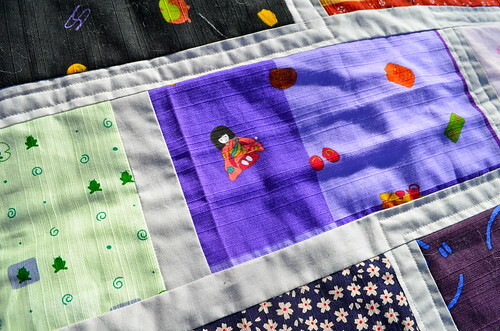 This is one of the first times I got to quilt with my walking foot, and it sure does make things easier! I must have cut into some of the Kona Ash I bought for this project as I didn't have quite enough to back it entirely in it. A little Lizzy House purple (from Hello Pilgrim? I think) and a strip of some leftover pieces of her fabrics finished it off. I am holding my breath now, because this is in the wash, on cold, gentle cycle. 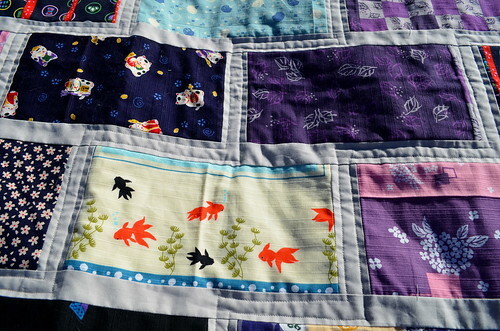 I have no idea what most of these fabrics are made of, but they don't feel like anything close to quilting cotton. I am especially worried about the pink guazy fabric above, but they do have a layer of lightweight fusible interfacing on the backs of those bricks. Cross your fingers for me! I was just thinking about y'all's friends in Tel Aviv this morning as I was listening to the reports on NPR. I'll definitely be thinking about her. Will we see you guys on Wednesday? Oh, fingers crossed!! it's beautiful! i will keep your friend Shara and her family in my thoughts...that must be so difficult, I can not even imagine. What a lovely keepsake you've made your friend! 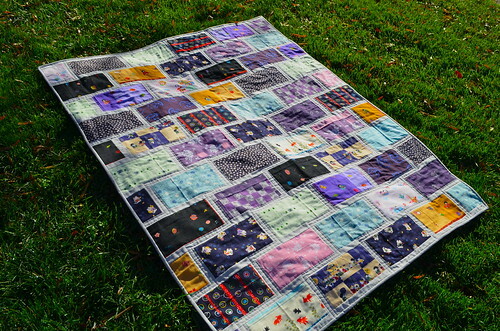 The fabrics are adorable... she'll love this quilt. I cannot imagine having to worry about missiles near my home while stressing about a newborn. I hope your friend stays safe. Good call on using the interfacing! It turned out so nicely. Thanks for sharing!